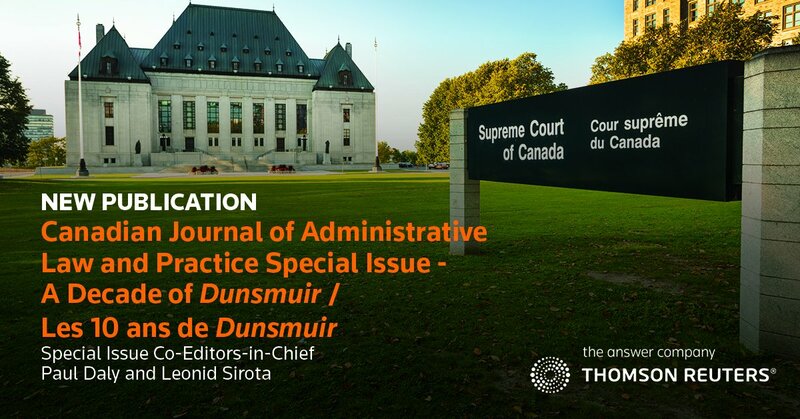 The special issue of the Canadian Journal of Administrative Law & Practice, featuring the contributions to this year’s Administrative Law Matters/Double Aspect symposium on Dunsmuir v New Brunswick  1 SCR 190, is now available for purchase. …of the view that these appeals provide an opportunity to consider the nature and scope of judicial review of administrative action, as addressed in Dunsmuir v. New Brunswick,  1 S.C.R. 190, 2008 SCC 9, and subsequent cases. To that end, the appellants and respondent are invited to devote a substantial part of their written and oral submissions on the appeal to the question of standard of review, and shall be allowed to file and serve a factum on appeal of at most 45 pages. The formulation in the National Football League appeal was slightly different, with no reference to devoting “a substantial part” of the submissions to standard of review. This is presumably because the Bell Canada and National Football League appeals concern the same underlying controversy about the Canadian Radio-Television and Telecommunication Commission’s decision to bring the practice of ‘simultaneous substitution’ during the Superbowl to an end. Identifying cause and effect is never easy, of course, and far be it from me to suggest that a pair of humble bloggers have any real-world influence, but it was striking that the Court indicated that it was considering revisiting Dunsmuir so soon after many of the great and good of Canadian administrative law publicly expressed dissatisfaction with the status quo. The Court will hear these appeals over three days from Tuesday to Thursday of next week (December 4-6). In an unusual move (given that the appeals are being fully and forthrightly argued on both sides), the Court appointed amici curiae, asking them “to assist the Court by serving and filing a single factum common to all three appeals…and by making oral submissions at the hearing of the appeal” (Docket, August 7, 2018). There are 27 interveners ranging from provincial Attorneys-General to provincial securities commissions, workers’ compensation boards and groups with interests as diverse as prison law, the rule of law and internet policy. A handful of the interveners have been given 10 minutes to make oral submissions, most of them will get 5 minutes before the judges and some have been limited to written submissions only. Almost all of the written material can now be accessed on the Court’s website: Bell Canada; National Football League; and Vavilov. To my eye only the responding materials from the Minister for Immigration and Citizenship (Vavilov) and the Attorney General of Canada (Bell Canada and National Football League) have not yet been uploaded. What can we expect in these appeals? As a general rule, there is an inverse correlation between one’s level of anticipation of an administrative law decision and the importance of the decision. Put another way: the more excited administrative law aficionados are beforehand, the more disappointed they will be afterwards. That there is great excitement about the Trilogy — and the line of 27 interveners is proof enough of that — does not bode well for those who hope the Court’s decisions will be definitive. As John Cleese put it so memorably: I can stand the despair, it’s the hope I can’t handle. I have long since got over my initial excitement about the Trilogy. To begin with, the range of issues in play in the Trilogy is quite narrow. Both Bell Canada and Vavilov turn on issues of statutory interpretation (and, relatedly, the extent to which the decision-maker adequately justified its interpretation); in Bell Canada there is a statutory provision (s.31(2) of the Broadcasting Act) giving an appeal on questions of law or jurisdiction. There is a Charter issue in Bell Canada but not one liable to lead to a rethink of the Court’s jurisprudence on the Charter in an administrative law setting. Procedural fairness was mentioned in the Federal Court of Appeal in Vavilov but has not been put in issue in the cases. In both of these areas, there have been judicial and academic calls for reform, but these important issues are unlikely to garner much attention in the Trilogy (albeit that the amici suggest, though not especially strongly, a change to the approach to the Charter in administrative law cases). For their part, the amici seem to have seen their role as arbitrating between the different factions on the Court. The pro-deference judges who are sceptical of the value of a contextual approach are given the recommendation of a general presumption of deference, triggered by any delegation of authority to a decision-maker. Their colleagues who would prefer a more interventionist approach in many cases and a more contextual approach in general are given the recommendation that appeal rights should be construed as requiring correctness review. The amici would retain the Dunsmuir framework and perform some tightening here and there, essentially by eliminating contextual factors in favour of a thoroughly categorical approach. Again, in the “here” and “there” there is something for both factions: the amici would abolish the category of ‘true’ questions of jurisdiction but add a new one based on persistent discord between different decision-makers (an issue that divided the Court in Wilson v. Atomic Energy of Canada Ltd.,  1 SCR 770); they would (perhaps) revise the Court’s approach to Charter issues; and each of the amici takes a different view on the retention of the category of general questions of law. As it happens, the amici’s advice has something of arbitral wisdom about it as far as the parties are concerned: Bell Canada would be sorry to see ‘true’ questions of jurisdiction demolished notwithstanding their argument for its retention and application but would welcome the amici’s suggestion that appeal rights should trigger a judicial power to authoritatively resolve questions of law. The Attorney General of Canada would be displeased with the latter advice but would no doubt be delighted about the systemic implications of the amici’s advice (mirroring the AGC’s submission) that any delegation of decision-making authority should, subject to a limited exception for constitutional questions, trigger an irrebutable presumption of deference. I have some doubts, however, about the wisdom of seeing the Trilogy as an occasion to bring different factions on the Court together or at least closer together. For one thing, the differences over the scope of true questions of jurisdiction and questions of general law of central importance to the legal system, and the role context can play in the standard of review analysis, are really symptoms of deep-seated disagreement about the foundations of judicial review of administrative action. Eliminating a category here and there and adding another set of cases in which the courts can authoritatively resolve questions of law will not eliminate deep-seated disagreement, which will inevitably continue to manifest itself (one way or another) in the selection and application of the standard of review. Put another way, without agreement about foundational issues — the basis on which doctrine can be built — there will be no lasting agreement about day-to-day issues with the application of the Court’s doctrine. 5) whether Canadian courts should persist with an the appellate standard of review whereby higher courts replicate the work done by lower courts. On each of these issues, there is a menu of doctrinal options (to which I and others, academics and practitioners alike, have contributed over the years). One’s doctrinal choices will be influenced by one’s foundational commitments and, ideally, nourished by knowledge of historical and comparative perspectives on administrative law. Without a deep theoretical discussion, informed by history and comparative law, it is unlikely that the Court will be able to develop a stable framework capable of uniting different factions and satisfying the wider Canadian legal community tasked with applying the Court’s framework. Resolving the wide range of issues with all appropriate information to hand may, frankly, be the task of a Royal Commission. Notwithstanding the three days of hearing and a team a of very able amici and interveners (not to mention law clerks), the Court is not a roving commission of inquiry and, accordingly, there is reason to doubt its ability to settle the standard of review for once and for all. Indeed, an appreciation of the limitations of the adjudicative process may have prompted the amici’s narrowly focused submissions. The Court may yet surprise us (and, despite the foregoing, I retain a glimmer of hope that it will), but we should probably expect the Trilogy to produce only slight modifications to the Dunsmuir framework. This content has been updated on November 26, 2018 at 15:51.